Are you an experienced or first time investor looking for secure and rewarding investment opportunities? Here at BlackStone Asset, we can help you. As an independent, global investment manager, BlackStone Asset has no greater responsibility than to its clients. We provides a wide range of investment management and advisory services to our clients that includes gold, bond, stocks trading, mortgage loan and Forex and mutual funds. 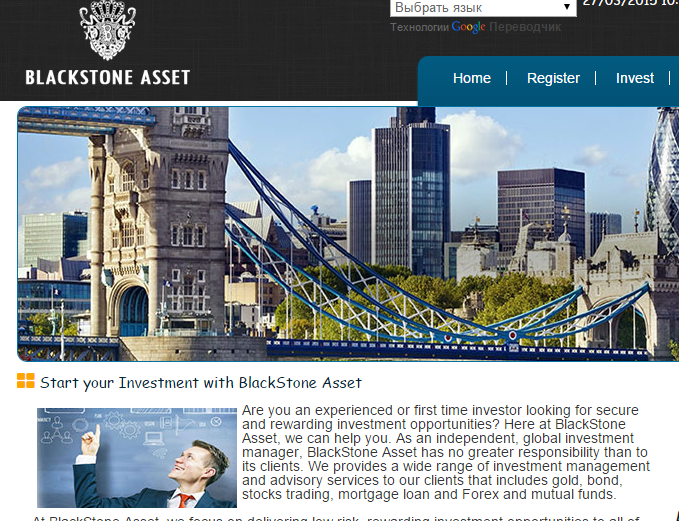 At BlackStone Asset, we focus on delivering low risk, rewarding investment opportunities to all of our investors. Established in 2014, we have used our years of experience to develop a reputation for delivering leading services that cater to all investors. We focus on the security of each investment, not only over the short term but the long term as well, ensuring a reliable return for each client. We're here to help when and where you need us, and lend the full resources of our firm toward realizing your vision. 01.28.15 13:41	Account	Transfer	-150.00	Sent Payment: 150.00 USD to account U8629362 from U4731311. Batch: 79803715. Memo: Shopping Cart Payment. Last Edit: 3 years 11 months ago by NikNak. Вы в новостях писали про план его новый, однодневный, он еще существует? Да, есть. Там минимальная сумма для входа на этот тариф 10000$. The amount of 1.35 USD has been deposited to your Perfect Money account. Accounts: U8629690->U2595577. Memo: API Payment.. Date: 14:12 31.03.15. Batch: 85359434.